The Australian New Zealand MS Genetics Consortium (ANZgene) is a collaboration of neurologists, genetic researchers, molecular biologists, data scientists and other researchers, from all around Australia and New Zealand who have an interest in understanding the genes that contribute to the development of MS. They have worked together over many years, with MS Research Australia’s support, to collect DNA samples from people with MS and analyse the samples to identify the MS risk genes. They have contributed to both Australian and international research developments that have led to the identification of over 200 genetic changes that contribute to MS. The goal of genetic research in MS is to identify the genes that influence a person’s risk of developing MS and the progression of disease. Identifying the genes which underlie MS will provide a better understanding of the cause of MS and its progression. Genetic information may used to design better therapies for MS, and in the future may also be used to predict a person’s prognosis and response to treatment. The Australian research community has been very active over the years in the field of genetic research into MS. Early in 2007 the MS Gene Bank was formed. The MS Gene Bank collected genetic samples from the people with MS in Australian and pooled the samples to increase researchers’ ability to make discoveries. Samples from New Zealand were added in 2008 and the Australia and New Zealand MS Genetics Consortium (ANZgene) platform was formed. MS Research Australia supported this endeavour in partnership with the Australian Research Council (ARC) via an ARC Linkage Grant. The ANZgene Consortium is a collaborative effort between a multi-disciplinary team of neurologists, geneticists, bioinformaticians and molecular biologists. MS Research Australia plays a secretariat role in coordinating the platform. The platform comprises eight geographical nodes with stewardship of over 3500 DNA samples for use in MS research. ANZgene members work together on research projects utilising samples from the collection as well as working with the International Multiple Sclerosis Genetics Consortium (IMSGC) on large scale genetic projects with worldwide involvement. Samples and data from the ANZgene Consortium are also available for use by researchers outside ANZgene upon application. ANZgene is custodian of the vast collection of genetic data from the previous and ongoing analysis of these DNA samples. MS Research Australia has also provided support for a bioinformatician, Dr Rodney Lea, to curate and analyse this data on behalf of the ANZgene group. The ANZgene Consortium has made a number of significant findings and publications, some of which are listed below. 2016 – ANZgene members examined the way that one gene behaves in immune cells to determine how it affects the risk of developing MS.
2016 – ANZgene members looked at the influence of genes on an individual’s response to treatment. 2016 – ANZgene researchers have identified new genes involved in the role of Epstein-Barr Virus in MS.
2015 – As part of the International MS Genetics Consortium, ANZgene investigated how the changes in the major MS risk genes work together to determine individual risk. 2015 – ANZgene researchers identified rare variations in a new gene associated with the risk of developing MS.
2015 – ANZgene researchers completed a study investigating the functional changes in immune cells caused by a particular gene that has been implicated in MS.
2013 – ANZgene contributed towards landmark international genetics paper which identified a further 48 genes involved in the risk of developing MS.
2012 – A study investigating the Alzheimer’s disease risk gene found it does not contribute to disease risk in MS.
2011 – With an international consortium, 57 new genes that contribute to the risk of developing MS were published in the prestigious scientific journal Nature Genetics. 2010 – Two microRNAs (regulators of genes) were found to be lower in people with MS.
2009 – In one of the earliest genetic studies, ANZgene researchers identified two new genetic sites that increase the risk of developing MS. Many other research projects have been made possible by ANZgene collaboration and samples. New findings are updated on the MS Research Australia website as they are published. 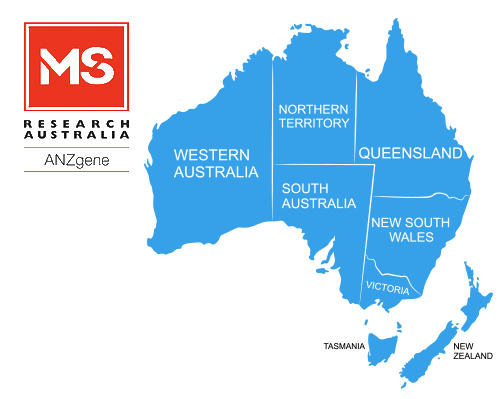 MS Research Australia and the ANZgene collaborators would like to thank the many people with MS who have contributed DNA samples to make this research possible. MS Research Australia is grateful for funding contributions from the John T Reid Charitable Trusts, the Trish MS Research Foundation, individual donors and an Australian Research Council Linkage Grant.